It is happening right now. There is new version of szukajwarchiwach.pl portal, more friendly and modern at a first look. Many new scans added, about 1,24mln of them.. Some units are empty, which means you can search them and find records but not actual scans. I guess scans will be attached later. I like the quality of scans. Need to find now a way to download scans of parish of interest all by once. How do I find these things? or "Databases in state archives"
by clicking on the grey X in the top right corner. have several places to try. for some cities, try doing a search for Lublin. Thanks everyone for letting me know about these records. Paul's instructions worked for me, and I have found my grandfather Jan Depa's 1893 baptismal record from Swilcza. My mom's cousin knew his father's name was Tomasz, and his mother's name was Agata Boczkaj, but now I know that Tomasz's father was Franciszek, and his mother's name was Agata Kornak. Agata Boczkaj's father was Jan, and her mother was Magdalena Cisek. I feel very fortunate, and I hope it won't be long before everyone can find new information from on online scan! 1. If one of the categories below interests you, click on the URL. 2. Then, in the left column, click the last item Inwentarz. you will see a hyperlink named “galeria ze skanami”. the existence of the Lutheran records. Feel free to repost this information on other lists. 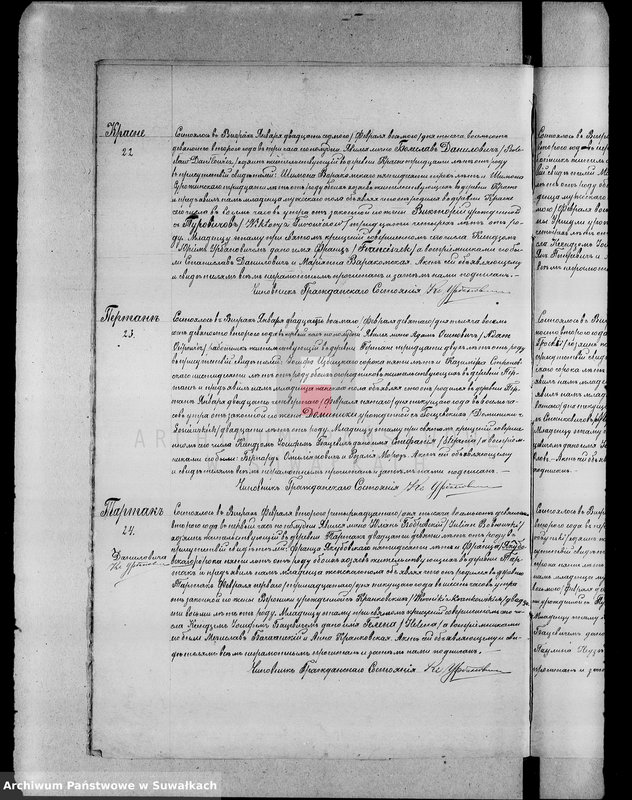 Polish State Archives have currently (23 June 2014) more than 11 589 600 scans available online! On June 5 Polish Archives added another 1.3 million scans. How to check if the desired parish records are available online? Does anyone know whether the records have been archived for the county of Maloposkie? The area I'm interested in is the village of Miedzyczerwienne (merged with Czerwienne in 1965). I believe the parish is Matki Bozej Czestochowskiej, Diocese is Krakowska, deanery is Czarny Dunajec. I've tried the search engine posted in this forum and don't get any results. Thanks PL. I was going to make a trip to the nearest Family Research Center, but if they dont have them on microfilm it would probably be a trip wasted! Im not sure how to go about checking films on familysearch.org. The only thing I've done there is searched by name, and I come up empty every time. In addition - and if you are not sucessful through 'places' option - I would recomend you the 'key search' option, by typing the name of the village there. ty PL and Gilberto, I will try that. Just got on this site today. I'm attaching a page that I downloaded. I was wondering if there is a way to increase the size of the page prior to downloading. In this attachment I'm interested in the 1st (top) entry...which I believe to be Krasne No. 22 in Wigry parish. Also, am I right to assume that this record is in Russian.